"LET'S GET READY TO RUMMMMMMMMMMMMMMMMMMMMMMBLE.........!" 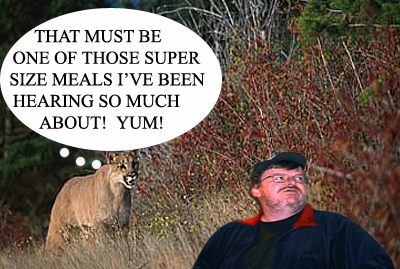 It's Mountain Lion Vs Mankind, in an Epic Battle Royale. Reports of mountain lions roaming neighborhoods and devouring family pets have cropped up from suburban Denver to Fort Collins, one of the most heavily populated stretches in the Rockies. In April, a lion attacked and broke the jaw of a 7-year-old boy on a trail in Boulder before it was chased off. The following month, witnesses said a mountain lion walked into a Boulder home, ate a pet cat and the cat's food before being captured. And a man shot and killed a 130-pound mountain lion that attacked his dog in May outside the family's home near Buckhorn Canyon in the Arapahoe National Forest. David Baron,[author of] "The Beast in the Garden: A Modern Parable of Man and Nature" suggests mountain lions may be learning to look at family pets and people as potential food. Ken Logan, a nationally recognized mountain lion biologist, said science doesn't support the premise that lions are starting to view humans as dinner. Barrett Johnson and his son were out on a four-wheeler about three weeks ago in a field in the Wild Oak Estates area in Seven Lakes when, "a very large cat" crossed in front of them. Johnson's wife, Anne, described the incident. "They saw a large cat that was tan or dark brown with very light spotting, and it had a very long, pipe-like tail," she said. A security guard at Seven Lakes made the original report of a mountain lion in the area June 28. Karyn Ring made a second report June 30 after seeing something "bigger" than a bobcat along Jackson Springs Road. Before the car we would live all scrunched up together. Because that's what we could afford. With the car we can live spread out. In addition, the car has increased real wealth, resulting in the capital necessary to develop the infrastructure necessary to establish and maintain residences in otherwise marginal territory. In addition, with our increased presence in the wild we saw a substantial decrease in predation by humans. Another consequence of our motorized society. Since we can transport food more readily between areas, there's less need to hunt for sustenance. Now add in regulations against hunting certain species, and naturally those species are going to 'bounce back'. So between us taking up residence in the mountains, and cougars taking up residence in the low lands, you get more human/puma interaction. Good points all, Alan. As people move more and more out of the cities and "sprawl" out for some elbow room, we will encroach on our neighbors in the wild. Thinning the herd a bit (of the animals, not the people. No...wait a minute.... ;-)) isn't such a bad thing. As you noted, there hasn't been a sasquatch attack for decades. And the reason why? We've killed almost of them! Thanks for visiting and commenting, Alan.